Twin shell powder mixers or twin shell blenders are designed to mix solids to solids, or solids to liquids. Twin shell blenders have two connected blending shells that are connected to form a V-shape. The V-shape of a twin shell blender results in more efficient blending. As the twin shell blender rotates and the V-shape is upside down, the product is divided into to equal or unequal volumes (depending on the design of the twin shell blender). As the twin shell blender rotates so that the V-shape is right side up, the product in both ends of the V accelerate towards the point of the V resulting in the impact of the two masses of product and increased product mixing due to the addition forces of the impact. V-shaped twin shell blenders can be outfitted with a rotating intensifier bar or liquids / solids bar. Intensifier bars are designed to break up clumps of solids while the product is separated in the two ends of the V (when the twin shell blender is upside down). Patterson Kelly, 5 ft³, 304 stainless steel, twin shell mixer. Equipped with (2) 19" ID product ports with bolt down covers, (2) 35" long side V-Walls and (2) 13" long inner V-Walls, 8"ID butterly valve discharge with 34" ground clearance and shell powered by a 2 Hp drive. Requires 90" ceiling clearance with 26" swing radius / 52" swing diameter. Mounted on painted A-Frame style base frame. Patterson Kelly Model 3 ft³, Cross Flow, 316 stainless steel twin shell mixer rated up to 290 lbs per ft³ – depending on materials and application. Equipped with (2) 15" ID product ports with quick release pin covers, (1) 25" / (1) 30" long side V-Walls and (1) 7" / (1) 11" long inner V-Walls, 6"ID butterly valve discharge with 33" ground clearance and powered by a 1 HP drive. Requires 80" ceiling clearance with a 23" swing radius / 46" swing diameter. Start / e-stop / reset push buttons, hand / jog / time control switch and digital blend timer controller. Unit mounted on painted base frame with lexan guarding and casters. Master blend yoke design, table top 2 quart twin shell mixer. All 316 stainless steel, V shaped blender has 11" long outside, and 3 1/2" inside dimmensions, (2) 6" diameter product ports with screw down covers. Push bottom start, stop and jog controls, plastic barrier guarding, is a all purpose blender for gentle dry blending, intensive dry blending of small lab batches. Last running in dental operation. Patterson Kelly, 10 ft³, stainless steel, twin shell powder mixer with number of lbs of product per hour – depending on materials, application and machine configuration. Bulk density rating: 90 lbs/ft³. Equipped with (2) 20" ID product ports with bolt down covers, 40" long side V-Walls and 17" long inner V-Walls with 25" diameter chambers. 8" ID butterfly discharge with 41" floor clearance. Mounted on stainless steel "A" frame with a 29" swing radius / 58" swing diameter. Patterson Kelly, 5 ft³, stainless steel, twin shell powder mixer with number of lbs of product per hour – depending on materials, application and machine configuration. Bulk density rating: 90 lbs/ft³. Equipped with (2) 20" ID product ports with bolt down covers, 32" long side V-Walls and 14" long inner V-Walls with 20" diameter chambers. 6" ID butterfly discharge with 35" floor clearance. Mounted on painted "A" frame with a 25" swing radius / 50" swing diameter. 10 Ft³, 304 stainless steel, twin shell blender. Product density: up to 55 lbs/ft³. Equipped with two 18" diameter inlets, epoxy coated interior, mixing bar, and an 8" diameter discharge with a butterfly valve. Mounted on an extended pedestal base. Patterson Kelly 3 cu ft, stainless steel twin shell mixer, rated to 60 lbs per cu ft, with pounds of product per hour – depending on materials and application. Equipped with (2) 12" ID product ports with bolt down covers, 30" long side V-Walls and 10" long inner V-Walls on 22" centers with liquid solids bar and 4" OD bottom discharge port with butterfly valve and 34" floor clearance. Control box has run / jog switch with start stop and e-stop push button controls. Mounted on (4) leg painted base frame with locking casters. Patterson Kelly, 10 ft³, 304 stainless steel, twin shell mixer. Equipped with (2) 18" ID product ports with bolt down covers, (2) 38" long side V-Walls, (2) 18" long inner V-Walls and intensifier bar powered by a 2 hp drive. 8"ID butterly valve discharge with 38" ground clearance. shell powered by 7½ Hp drive. Requires 149" ceiling clearance with 37" swing radius / 74" swing diameter. 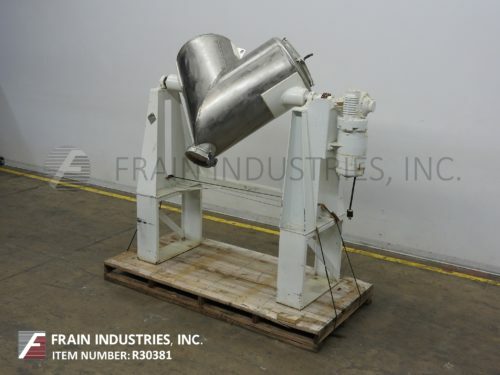 Patterson Kelly,10 ft³, 316 stainless steel, twin shell mixer. Rated to 75 lbs per ft³ with Ibs of product per hour – depending on materials and application. Equipped with (2) 18" ID product ports with bolt down covers, (2) 43" long side V-Walls and (2) 15" long inner V-Walls. 8"ID butterly valve discharge with 38" ground clearance. shell powered by 3 Hp drive. Requires 106" ceiling clearance with 34" swing radius / 68" swing diameter. Patterson Kelly, 5 ft³, 316 stainless steel, twin shell mixer. Rated to 70 lbs per ft³ with Ibs of product per hour – depending on materials and application. Equipped with (2) 18" ID product ports with bolt down covers, (2) 34" long side V-Walls and (2) 10" long inner V-Walls, liquid solids bar and 6"ID butterly valve discharge with 36" ground clearance. Requires 96" ceiling clearance with 30" swing radius / 60" swing diameter. Has push button start / stop controls and digital timers. Mounted on (4) stainless steel frame with casters and safety guarding. Patterson Kelly, Model 5 ft³, Cross Flow, 316 stainless steel twin shell mixer rated up to 106 lbs per ft³ with pounds of product per hour – depending on materials and application. Equipped with (2) 18" ID product ports with clamp down covers, (1) 30" / (1) 36" long side V-Walls and (1) 8" / (1) 13" long inner V-Walls, 6"ID butterly valve discharge with 28" ground clearance and powered by a 1 HP drive. Requires 92" ceiling clearance with a 32" swing radius / 64" swing diameter. Control panel with push button start / stop, hand / jog / time control switch and digital blend timer controller. Mounted on stainless steel base frame with lexan guarding and locking casters. Patterson Kelly,1 ft³, 304 stainless steel, twin shell mixer. Rated to 60 lbs per ft³ and Ibs per hour – depending on materials and application. Equipped with (2) 11½" ID product ports with bolt down covers, (2) 16" long side V-Walls and (2) 7" long inner V-Walls. 6"ID butterly valve discharge with 29" ground clearance, liquid solids bar with a ¾" NPT connection powered by a 2 HP drive and shell powered by ¾ Hp drive. Requires 65" ceiling clearance with 20" swing radius / 40" swing diameter. Has push button start / stop controls. Mounted on base frame with casters.